High-school junior Leila has made it most of the way through Armstead Academy without having a crush on anyone, which is something of a relief. Her Persian heritage already makes her different from her classmates; if word got out that she liked girls, life would be twice as hard. But when a sophisticated, beautiful new girl, Saskia, shows up, Leila starts to take risks she never thought she would, especially when it looks as if the attraction between them is mutual. 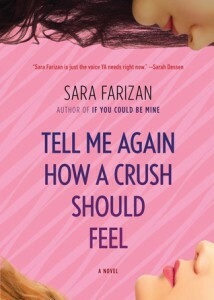 Come discuss the novel Tell Me Again How a Crush Should Feel by Sara Farizan with us!